Top image shows a complete 6 axis setup containing two PMDX-133 boards set up with typical installation using a PMDX-126, ribbon cables, and 6 Gecko G203V drivers. This image is a top view showing Geckodrive G203V drivers installed under a PMDX-133. This image is an edge view showing Geckodrive G203V drivers installed under a PMDX-133. This image shows the bare PMDX-133 as delivered. 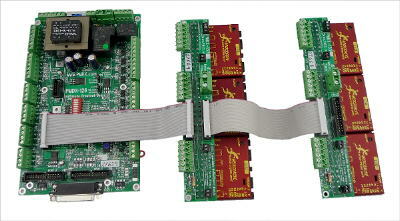 The PMDX-133 is a mother board for interfacing Gecko stepper drivers with CNC controls. A single board is great for a 2 or 3 axis system. Two boards can be daisy chained for up to 6 axes from a PMDX-126 connected to two parallel ports or a SmoothStepper which allows enough signals to run 6 axes along with spindle control and other output functions. Two boards can be daisy chained for up to 6 axes from a single parallel port if the control signal outputs (pins 1, 14, 16, and 17) are assigned as step and direction signals. Each PMDX-133 mates directly with up to 3 each G201X or 3 each G203V Gecko drivers by plugging onto terminal strip pins of the drives. NOTE: The PMDX-133 does NOT support mixing G201X and G203V drivers on the same PMDX-133 board. Future Gecko stepper drivers that use Ground as COM (common) for Step and Direction may also be compatible. Simplifies system wiring and makes most connections pluggable. Does NOT support the G320 and G340 servo drivers or older G201, G202, G210, and G212 stepper motor drivers. Can connect to PMDX-125 or PMDX-126 using a PMDX-HDR26Ribbon or a PMDX-HDR26Ribbon-18 cable. Can connect to other breakout boards with compatible parallel port ribbon header connectors. Can connect to the SmoothStepper or other pulse generators with parallel port style ribbon header connectors. Motor connections are made by re-using the pluggable terminal strips supplied with the Gecko drivers. (revision 1.2, 172 KB, 6 Dec 2013).